Signed below left: Jos Highmore pinx:/1740. 1) A Voyage performed by the late Earl of Sandwich round the Mediterranean in the years 1738 and 1739, written by himself, 1799, p III; the marble inscription he gave to Trinity College, Cambridge. 2) N. A. M. Rodger, The Insatiable Earl, 1993, p 7; see J. Sweetman, The Oriental Obsession, 1988, pp 63-64. 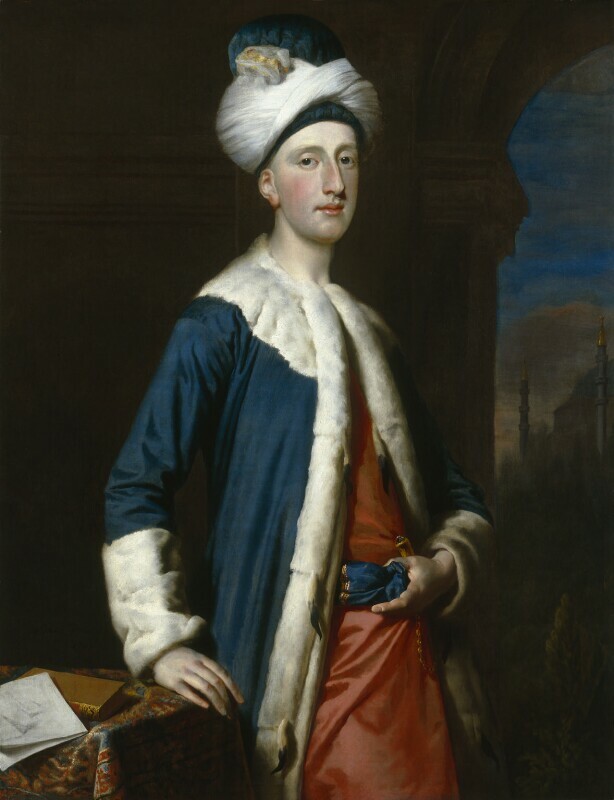 3) A similar cloak is worn by Ponsonby in his portrait by Liotard (Stansted; illus. Liotard, opera complete, 1978, no.48, tav.VII). 4) The minarets agree with the engraving by John Cooke in A Voyage performed by the late Earl of Sandwich round the Mediterranean in the years 1738 and 1739, written by himself, 1799, f.p.131, presumably copied from drawings made during the voyage. 5) Cf. the [six] engravings of the pyramids in A Voyage performed by the late Earl of Sandwich round the Mediterranean in the years 1738 and 1739, written by himself, 1799, f.p.456-61. 6) See J. Kerslake, National Portrait Gallery, Early Georgian Portraits, I, p 188-89, II, pl.549. A. S. Lewis, 'Joseph Highmore', D. Phil thesis Harvard, UMI, 1979, II, no.151. Dark grey eyes, wearing a blue cap below his turban, a red kaftan beneath a blue coat trimmed with rat-tailed ermine; in his deep-blue belt with red and gold decoration, a gold-handled dagger; on the table covered with a Turkey rug, a paper with drawings of pyramids; on the right a distant view of the minarets and dome of the Hagia Sophia. ‘A Lady of Rank’, sold Christie’s, 11 June 1870, lot 145 (as Lady Mary Wortley Montagu);1 presented anonymously 1923. 1 The anonymous donor still believed in 1923 that it showed Lady Mary (letters in NPG archive). Highmore, Kenwood, 1963 (12); The Dye is now Cast, NPG Washington, 1975 (159); Bicentennial Center Opening, Yorktown, Va., 1976; Beningbrough 1979-.